How did you find out that this would be ’24’s final season? We knew it was kind of lurking. It had been rumored for a little while. It was more so that we were waiting for someone to gives us the official word. It was kind of strange that it was dragged out. We found out on set from [Executive Producer] Howard Gordon. We were waiting to hear if another network would pick us up. How do you feel about the show coming to an end? It’s bittersweet. As an actor, you’re prepared for shows to come and go. And so that part I’ve always been prepared for. But as a fan of the show which I am and was since the very, very beginning — I’ve seen every episode since the very first one– it’s sad mostly [because] the show is doing so well. If a new show came out now and debuted with eleven million viewers then stayed around nine, never in a million years would they ever cancel the show. But it’s so expensive [to produce.] It was one of the most iconic, groundbreaking game changes in television. It’s a privilege to have been a part of it and to get to be there for two years was great. Since you were a fan, joining the cast must have been a dream come true. When you got the audition, how did you prepare? I had done a pilot with the creators of 24. About six months before, I had worked with [Executive Producer] Joel Surnow and Jon Cassar, one of the directors. Even that was exciting. Then that pilot didn’t get picked up so I was like, “Ooh, I wonder if maybe, just maybe I could go in and audition for a guest star in one episode.” So when I got the call to audition for a series regular and then found out it was a lead female agent that would go toe to toe with Jack Bauer, I was just in awe. It all happened pretty fast. I was cast about a week and a half before we started shooting. I definitely think being a fan helped in terms of knowing Jack’s history with different women and different partners that he’s had. 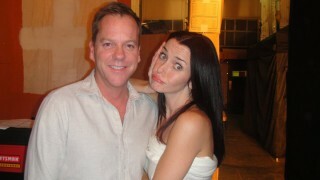 You and Kiefer Sutherland have such great chemistry. How did you build that connection? It’s something that we luckily just sort of had and found from the very beginning. And thankfully so. I think if that hadn’t really been there, the role might have taken a different turn and Renee may have not made it through season seven. He’s so dedicated and invests in the show with every single moment. There’s no way you could show up and not be on your A game. So I came prepared. When he knows that you’re going to show up ready to play on the same level that he is, that helps immensely in terms of gaining a trust between the two of you. When you found that Renee was going to be kind of crazy this season, what did you think? I knew that it was going to be a darker path and she was no longer with the FBI. I knew that something in her past was going to be directly involved in what she was doing now. That’s pretty much all I knew until I got [the script for] that first episode, which for me was episode four, and by the time I got to the end I was cutting off someone’s thumb. It was fun because I had such a great arc with the character of Renee last season from where she started episode one to episode twenty-four. It was really invigorating to get to do something completely different. When viewers last saw Jack and Renee, they were were in a shoot out and had just found the man who was working for the rogue general and wanted to deliver President Hassan to the terrorists. How do they get out of that mess? We’re trying to protect President Hassan. He doesn’t make it easy for us because he’s trying to do a noble thing. He has his own challenge to what we’re trying to do. In a typical Jack way, it’s never going to be quite like you think it’s going to be. At any point does Hassan lose his hairsprayed pompadour? Absolutely not. It may be a little bit more tousled because he’s running. What have been some of your favorite scenes as Renee? What I love about her so much is that I can go from a Wednesday where all I do is run and shoot weapons and hang off the side of a car and do all this crazy stuff and then the next day it can be this huge, dramatic heavy dialogue with Keifer Sutherland. It’s such an amazing role, definitely the role of a lifetime. I love the big scenes that are those huge 24 moments, like getting buried alive last year or cutting off the thumb this year, those things that you know are going to be such a big deal. But then I always love the scenes that are just Jack and Renee talking about a lot stuff. Last season in particular I found it very interesting that they got to have so much dialogue and discussion about torture issues. I loved the scene in the hospital where she slaps him. I love the scene this year when Jack and Renee see each other for the first time. Have you found out if you are going to be in the ‘24′ movie? I certainly hope so. With 24, I hope that I live to the next episode every week. I think, first of all, that the show is going to be so amazing on the big screen. I would love to run around with Jack Bauer wherever he ends up next. Do you know how the series ends? I do. Wouldn’t you like to know? How much money would it take to get you to divulge that? A lot. And you’d have to guarantee me another job. It’s going to be amazing. Jack Bauer definitely goes into the Jack Bauer moments that fans just go crazy for are definitely in the future episodes. I do not think anyone’s going to be disappointed. You are expecting a baby. Does that make it more difficult to shoot ’24’s action scenes? It hasn’t been bad as far as how I’ve felt physically. It’s more about making sure you can tweak wardrobe things here and there. It was actually easier to hide my little baby bump that was forming than a couple of other things that get really big when you have a baby. Wardrobe was very good to me with jackets and shirt sizes going up. A teenage girl has started a Facebook group to get you on the Ellen DeGeneres Show. Has anyone from Ellen contacted you? No, we’ve not heard from the Ellen Show as of right now. These girls are doing all these things to campaign. This girl went skydiving and wrote on her hand, “Annie on Ellen,” and posted a picture of it on the group. There are other girls making raps. They’ve e-mailed Ellen and tweeted her all the time. Ellen’s probably going to get so annoyed she’s probably be like, “Fine.” It’s very sweet what they’re doing. Have you ever used any of your ‘24′ secret agent skills in real life? I like to recreate some of the fight work that I’ve done on my friends. I still remember the exact choreography of fights I had last season.